There isn’t a Mom around who doesn’t love to receive a gift of flowers from her favorite offspring. And happily, the selection of flowers available is never better than now. Spring blooms such as tulips, hyacinths, and daffodils have not quite come to the end of their season, while summer flowers like lilies, peonies, and larkspur have already begun theirs. Of course, roses are always available and always a good choice; the range of sizes and colors being produced today is unprecedented. More information and pretty pictures of flowers can be found on Flower Shop Network. Bright, summery rose varieties include ‘Golda’ (intense, sunny yellow), ‘Sari’ (lively apricot), ‘Livia’ (clear, warm pink), ‘Raphaela’ (deep coral), ‘Peckoubo’ (creamy peach), and the vivid bi-color ‘Carnaval’ (white with a magenta edge). 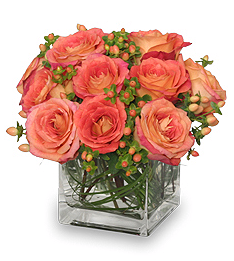 Roses look great presented in a vase by themselves, or accompanied by a delicate filler flower like ‘Misty Blue’ limonium. But they also work well in mixed bouquets with other colorful flowers, adding a touch of elegance that lets Mom know how much she is loved. A cheerful, garden-themed arrangement with a variety of fresh cut blossoms in a vase or a basket, or even a terra cotta pot, will surely bring a smile to Mom’s face, and your professional florist can help you make the right selection. The addition of an artistically curving branch or a handful of wispy grasses can add a lot of personality to the design. Naturally, part of the unique appeal and indulgent charm of fresh flowers is the fact that their beauty is so fleeting….it simply makes them all the more precious to us. To help cut flowers last longer, it is useful to change or add fresh water daily, keep them away from heat or cold and out of drafts, remove any spent blossoms, and use a fresh flower nutrient solution (available from your local flower shop). Vibrant blooming plants are also abundant at this time of year, including cyclamens, gloxinias, fancy chrysanthemums, and kalanchoes. Some varieties, such as azaleas, hydrangeas, and potted lilies can be replanted outside in the garden to bring joy to Mom’s heart year after year, reminding her of how special she is to you. Mothers add a lot of color to our lives… they surely deserve to get a little bit back! Call or visit your local florist right away, and have your Mother’s Day surprise delivered early next week to maximize your Mom’s delight.